Somewhere along the time I joined ACFW and the blogging world, I ran into Melissa Tagg. I don't remember the exact date, but I do remember her making me laugh...like uncontrollably. 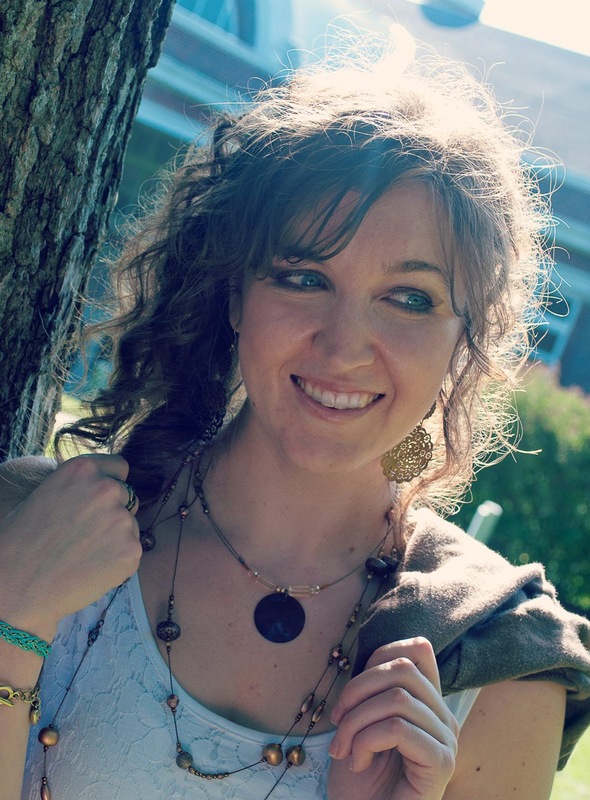 Not only did that keep me coming back to her blog, but it opened the door to friendship. Then her first book debuted and not only was she a friend, but one of my favorite authors. She's an amazingly sweet, funny, talented, kind (and several more adjectives) person and I'm super excited she's here today sharing from her heart. True confession: The other night I tried to multiply. On paper. Without a calculator. And I literally could not remember how! I wish I were joking. I really do. But after about five minutes of staring at the numbers on paper, I gave up and opened the calculator app on my phone. Now, I have a minor excuse for my lapse in basic arithmetic skills: That night I was just coming off a three-day writing binge. And by binge I mean I spent between nine and ten hours each day writing, rewriting and editing. I racked up 22,000 words at the end of it all. And also, clearly, killed off a ton of brain cells. Because, I mean, come on…math might be the academic version of beets (gross!) in my world, but still. I should be capable of a basic three-digit-number by two-digit-number feat of multiplication, shouldn’t I? However, even as I laughed at myself that night (and wondered what my elementary school teachers would think of me now), I had a moment of intense happiness at the thought—the knowing, really—that I’d just spent three days doing what I was meant to do. Oh, I know I’m meant to do more than write. I know writing doesn’t define me. I know “writer” is not the sum of my identity. But writing, storytelling, spending hours of my day using the creative (and obviously very non-mathematical) bent God gave me to produce a story that is hopefully fun and funny and swoony and maybe even a little thought-provoking…it’s what I’m supposed to be doing right now. I just know it. I’m not sure it’s what I’ll be doing in a couple decades or a couple years or even a couple months. I’ll be honest, as someone who both writes and works full-time at a nonprofit, some days I think it’d be smarter—and a heck of a lot easier—to stop having two lives and just pick one career once and for all. And if I have to kill off a few brain cells, if I have to get down and dirty and tired writing this thing—tired enough that simple math looks like rocket science—it’s worth it. 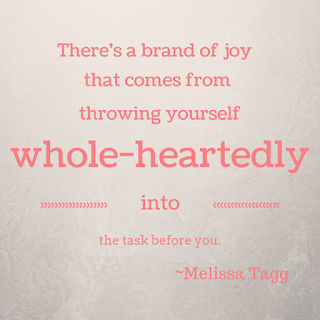 There’s a brand of joy that comes from throwing yourself whole-heartedly into the task before you. An energetic kind of exhausted. And I’m experiencing that right now. And I’m truly, truly grateful. What do YOU throw yourself into? What makes you exhausted in a good way? Melissa Tagg is a former reporter, current nonprofit grant writer and total Iowa girl. She writes romantic comedy for Bethany House, and is also the marketing/events coordinator for My Book Therapy, a craft and coaching community for writers. When she’s not writing, she can be found hanging out with the coolest family ever, watching old movies, and daydreaming about her next book. 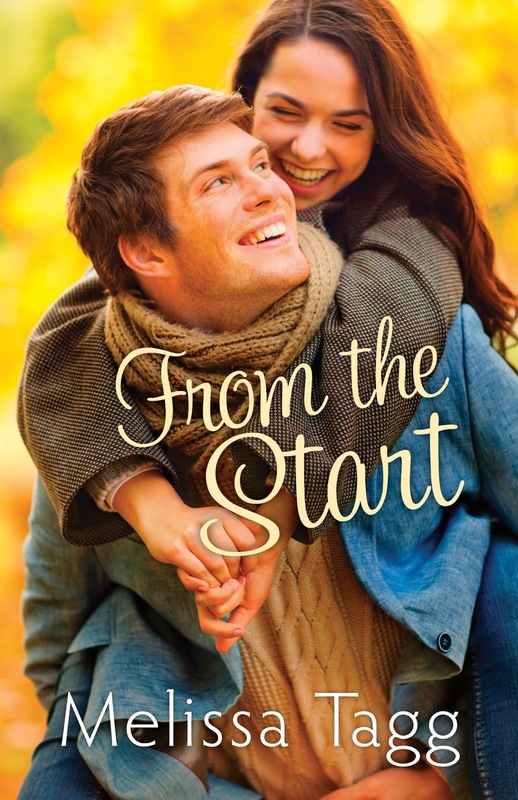 Her latest book is From the Start, the first in her new Walker family series. Check out the FREE enovella prequel, Three Little Words. 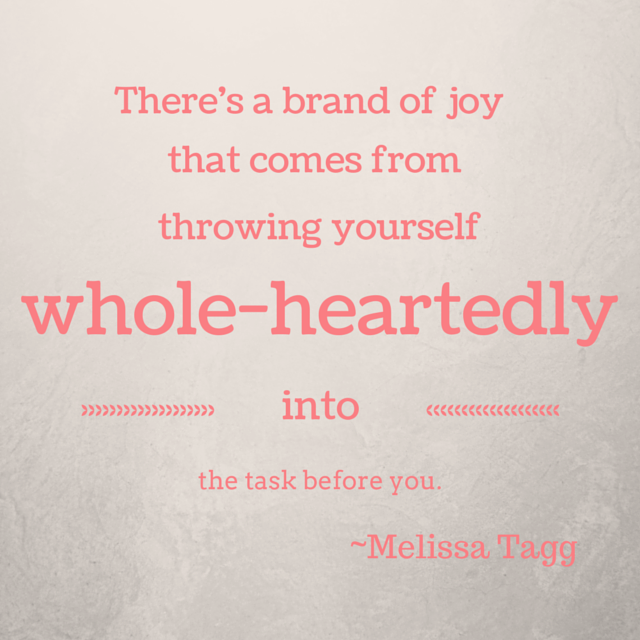 Connect with Melissa at www.melissatagg.com, Facebook, Twitter (@Melissa_Tagg) or Instagram (melissatagg). I've never forgotten how to multiply, and I've never been able to make the time to write for 9 hours straight. that might be enough to make me forget my name, but I'd like to try it. Thanks for sharing. I can't wait to read From the Start. Your stories make me happy. I hope you and Susan have a great week! Hope you enjoy FTS, Jackie! Lol! Melissa you are always welcome whether you can multiply or not!